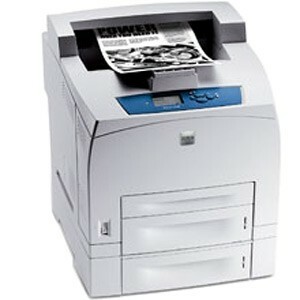 With the 4510B, 4510N, 4510DT and 4510DX laser printer models, the Xerox Phaser 4510 series offers a variety of features such as duplexing, networking and Bluetooth technology. The base model is the most affordable as it excludes these extra elements, but it has the same fast speeds of up to 45 pages per minute for monochrome projects. The 4510 is still a pricey unit nonetheless, but large-volume workgroups will benefit from its advanced features and high-capacity Xerox 4510 printer toner. The unit incorporates a long list of print features including booklet printing, poster printing, edge-to-edge printing and image smoothing. Flexible media handling comes with a standard dual 550-sheet trays and 100-page multipurpose tray that can be expanded to include various other bins, for a total capacity of 1,250 pages. Although it has large volume perks like expandability and a maximum monthly duty cycle of 250,000 pages, the device still manages to be compact enough for a desktop surface with a size of 16x18x15 inches. Expert tests on print quality show grayscale photos and monochrome text projects to print with smooth detail and dense characters. 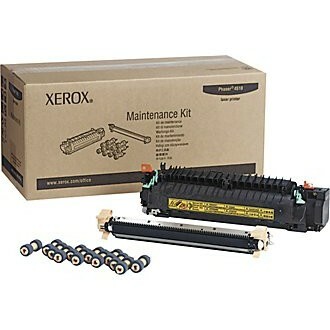 The device is capable of creating documents with a maximum resolution of 1200x1200 dpi using black Phaser 4510 toner. With management technology like Xerox CentreWare Printer Management and Printing Scout Alert Notification software for toners and documents, users can maintain control over projects to ensure they have consistent and professional quality. 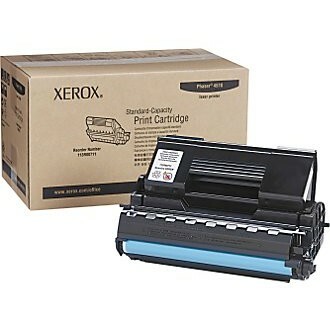 Users can shop at third-party sites to purchase supplies for the unit such as Xerox 4510 toner cartridges and a 200,000-page maintenance kit, which will save money over genuine supplies. The standard black Phaser 4510 toner can yield approximately 10,000 pages and the high-capacity supply can print up to 19,000 pages. From cost-efficient, large yielding Xerox 4510 toner cartridges to upgradable paper handling and fast speeds, this device is ideal for busy workgroups. The upfront price of the different models tends to be a bit high, but upgradeability and low running costs will be worth it in the long run.